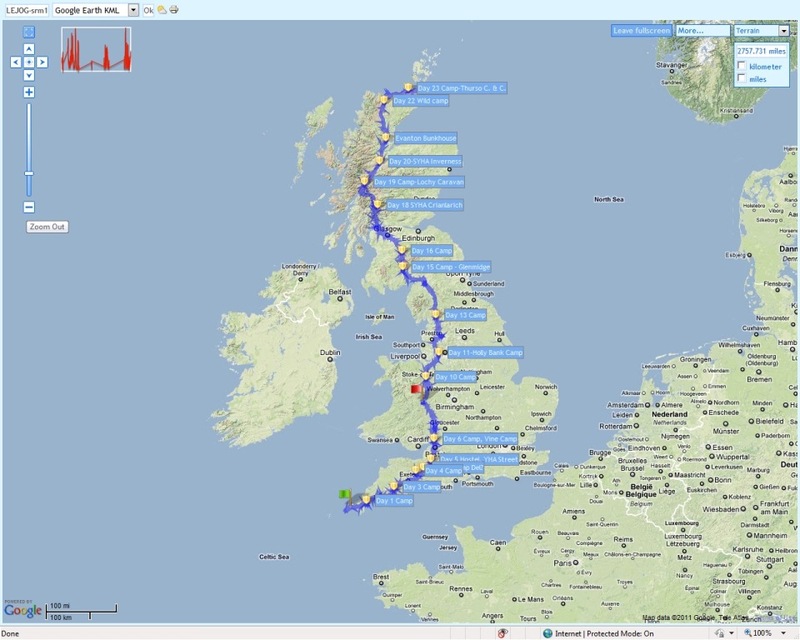 Thanks for stopping by the website I used to describe my cycle trip across Britain, in the summer of 2011. I enjoyed the sights and little adventures, but most of all, I enjoyed the wonderful people I met. The links below show some of my favorite moments. After that, there’s a description of my route and some maps. Since I used a sat nav to navigate, I have a record of the exact route I took, including some frustrating wrong turns. The first picture below is an overview. The rest are close views, from north to south. The close views show the varied landscape of Britain. The close views make it appear that the last part is the most hilly, but actually, the first few days were, on the peninsula in the south-west of the country. The hills may not have been as high as others, but they were frequent. In the south-west, there were few places where the route had a flat spot for longer than a half mile. Maps were generated at GPSies.com, which uses Google maps as an inital map source.